Egypt is not exceptional. Unfortunately, those are four words practically no Egyptian or world observer of Egypt accepts, and the longer it takes for this reality to set in, the more torturous the path of reforming Egypt will be. From birth to the grave, Egyptians are fed a steady diet of self-edifying drivel about their uniqueness, based on everything from the civilization built up by the Pharaohs seven thousand years ago, to their supposedly superior ability to do anything and everything in modern times. The inconvenient truth of the chaos and underdevelopment that defines Egyptian life always is the fault of some sort of other (from either within or outside of Egypt), and the path forward is one that Egyptians can define without reference to lesser places like the United States, the entirety of Europe, India or China - which are still somehow widely considered less advanced - or anywhere else for that matter. Hence, the zig-zagging approach to drafting a new constitution, the obtuse definition of the relationship between state and religion, economic policies which, to be generous, can only be considered as idiosyncratic, and the omnipotent short cutting and rule bending of Egyptians on anything and everything. The world, led by the United States, has reinforced this exceptionalism by playing along to and expanding the mantra of Egypt’s special role in the region. Thus, the tens and tens of billions of dollars in grants, debt relief and concessional loans that though well meaning, have retarded the country's economy, and kid-glove treatment on the blatant disregard of universal norms of respect for individual and minority rights by Egypt’s power structure (which structure extends far beyond a single leader or institution, but rather is the potent combination of the repressive central state and mob rule that has defined Egypt since 1952, and still does). 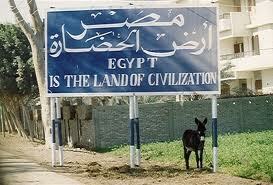 All this must stop if Egypt is to finally break from its depressing modern history. Egyptians, and the world, should judge the country by what it is (a country with 85 million, largely young people who want to live better and more prosperous lives like anyone else), and what it contributes (human capital that produces excellent artists, scientists, engineers, doctors, farmers, teachers, capitalists and others, the world’s finest cotton and oranges, steady energy supplies for a large part of the Mediterranean, including Italy, Spain, Israel and the Levant), and not by what it is not (some hopeless place that defies time and place and that is incapable of development) or what it is supposedly serving as a bulwark against (wild-eyed ambitions of Persian and Gulf Arab expansionism or apocalyptic violence between Israelis and the Palestinians). No more mind control deluding Egyptians into believing that they are from another world. No more special speeches from an ignorant U.S. president that seeks to justify the unjustifiable; if there is a need to intervene and comment, do so in a manner that reinforces, rather than comprises, principles of individual liberties. No more international bail outs that cover up incompetent economic policies in the name of stability and aid. It is time for Egypt to be Egypt – a Mediterranean country with human and natural resources that are at its disposal to foster. Nothing more, nothing less.